CENTRAL LAKE -- Year two into their program, the Johannesburg-Lewiston girls’ cross country team are Ski Valley champs. Behind a balanced effort, the Cardinals won the SVC Championships Wednesday at Central Lake, besting second-place Inland Lakes by seven points. Leading the way for the Cardinals was sophomore Meridith DeLuca, who took fourth with a time of 21:00. Also for J-L, sophomore Nicole Bush took ninth (22:19), senior Allison DeLuca took 11th (22:53), senior Stephanie Fisher took 12th (23:13), sophomore Miranda House took 16th (24:00) and junior Amanda Cox took 23rd (26:07). For St. Mary, eighth-grader Becca Masko placed eighth (22:15), senior Nicole Blanzy took 13th (23:31) and junior Hannah Masko took 19th (24:45). Both Bekah Masko and Blanzy recorded personal-best times. Bellaire’s Emily Kwekel won the individual race with a time of 20:06. 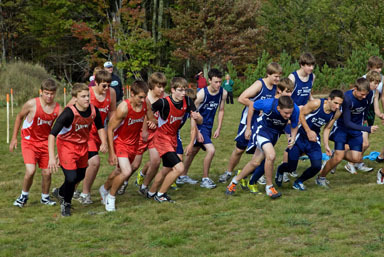 In the boys race, St. Mary placed third, while Onaway was the league champion. Leading the Snowbirds was senior Pat Makarewicz, who took seventh (18:32). Also for St. Mary, sophomore Luke Wisniewski was eighth (18:36), senior Cody Rivers was 15th (19:13), freshman Dylan Masko was 19th (19:37) and sophomore Luke Brown was 22nd (20:10). Recording personal-best times for the Snowbirds was Makarewicz, Wisniewski, Dylan Masko, Brown, Quinn Marquard and Aaron Crawfis. Steven Geary was the highest finisher for J-L, taking 27th with a time of 21:00. Central Lake’s Jordan Becker won the boys race, with a time of 16:50. In the middle school race, Nick Masko took fourth, Connor Reppuhn sixth and Michael Masko seventh. All three recorded personal-best times. For the girls, Savannah Sulllivan was 10th and Natalie Burzynski was 11th. Sullivan had a personal best time.